Muggy, dark, heavy. The air is so still that I can hear the buzzing of flies from far away and yet feel every nuance of insect touch at the same time. It is a visceral feeling as true as what I am offered as a springboard for inspiration each morning. I’ve learned over the past few weeks that what will come will come to me unsolicited. Sometimes it is in the car on the way here, sometimes just as we are entering the trail, sometimes not until the final stretch. It is most often just a single word. Ironically the word this morning is ‘single’. And oh, is this a loaded word for me these days. Nora and I haven’t even reached the entrance to the trail and I’ve pulled the camera off my shoulder to shoot a particularly compelling stand of mauve violet wildflowers against the forest beyond. There is something about the community of flowers coming together as one in their equal relationship with the community of trees beyond that have come together as one that feels significant. Flipping the switch to on, I am met with silence instead of the rrrring sound of the lens coming out in readiness. And realize that the battery is still sitting in the charger at home! The sinking feeling of disappointment is met with disbelief that I will now be having my adventure this morning without the ability to record with images. I have to let go of a knot of worry that I might not be able to share in the way I have become accustomed. I watch my attachment to this morning practice loosen its grip a bit, and feel the difference of how much having the lens between me and my beloved trail changes the way I relate. I am single. Unattached. At this stage of life, it is a minority status. Some express envy at this status and the association of freedom that comes with it, but most remain silent. How I relate and socialize in my community changes with this status. Not being the other half of a team changes how my community relates to me. It’s all a matter of perception. Out there in culture, I can’t help feeling like that individually wrapped piece of cheese in plastic that comes in a stack isolated from the rest, instead of being stuck together with other slices sharing the same package. But out here? As Nora’s human, I am part of a team first that feels as integrally a part of the whole of this beautiful landscape as the singular tree or rock or bird. Here I can be single without even my own expectations getting in the way. Driving back though our neighborhood and up to the house, I realize that to get lost in the notion of being single in community is an oxymoron. Something can’t be a single unless defined in relation to a double or a triple or a whole bunch. Everything is in relation. Every single thing. 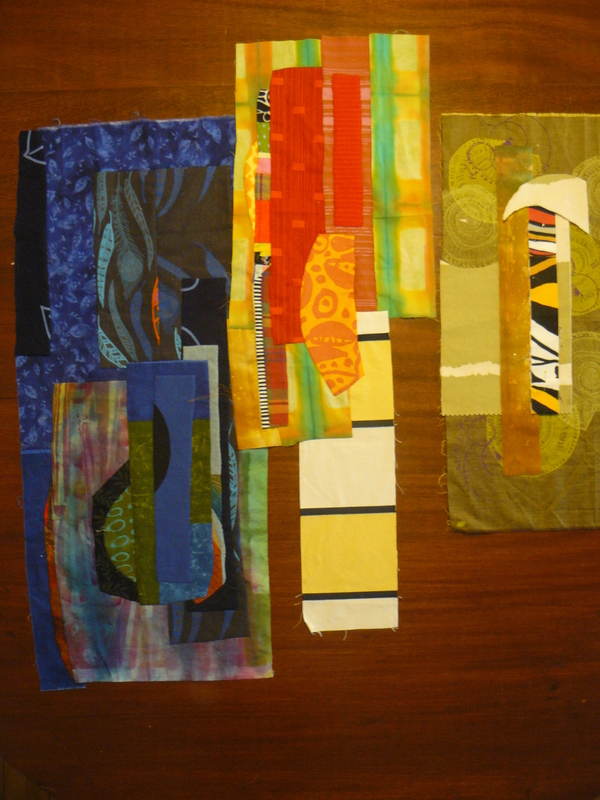 All I have to do is look at one of my quilts to know this truth. It is impossible for there to be a single anything in a quilt. Sure, there are whole cloth quilts cut out of a single piece of fabric, but turning it into a quilt requires thousands of quilting stitches to bind the three layers together. Tens of thousands. A whole village worth of stitches. On my dining room table are the three finished hand appliquéd pieces that will be joined together with other pieces of fabric to complete the whole. Right now they are each single constructions that could stand on their own. But they want to be joined together and so they shall. In my hoop is the piece I am currently hand quilting. Each single stitch contributes to a pattern of single circles that define the essence of this piece. 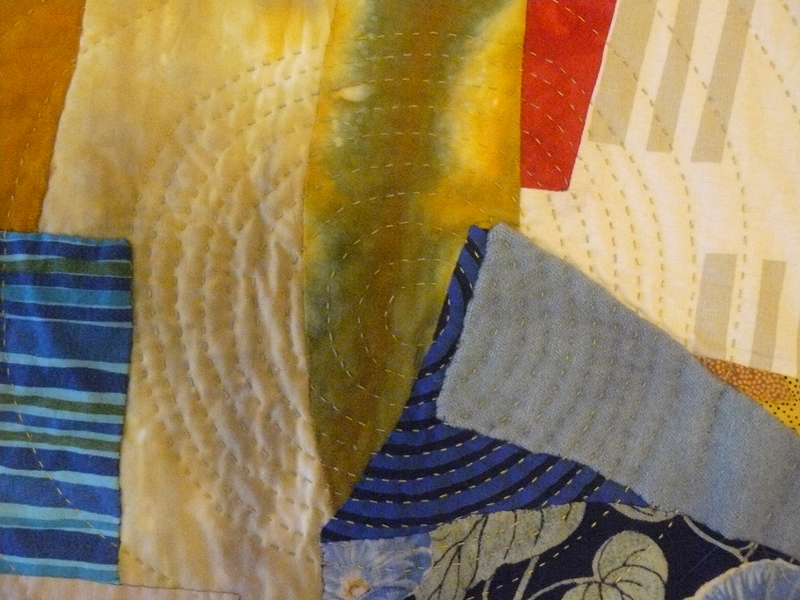 When I am quilting it is the same feeling as being out on my beloved trail. With each stitch taken, I am one with the piece and time stops in the process. I know that being single will continue to present its challenges to me. But being aware of the power of removing the lens or the piece of plastic that metaphorically separates me from my community will go a long way. Heeding the inspiration that comes to me each day will go a long way. And experiencing the visceral touch of communion with both my beloved trail outside and beloved quilts inside will go a long way. Looks like another masterpiece in the works….